The new fleet includes the new Toyota Prius and the new Toyota Camry Hybrid. The Toyota Prius is the most fuel efficient car sold in the US. The new Prius is also a bit larger and has greater passenger comforts. The new Camry Hybrid has been voted the Car of the Year in the family sedan category. EV Rental Cars, LLC opened its doors in December 1997 as the first car rental company in the US to rent only environmentally-friendly vehicles to the public. Since then, the company’s fleet has grown to more than 350 cars at seven locations throughout the country. Airport locations include California sites in Los Angeles, Orange County, San Diego, San Francisco, Oakland, and San Jose; in addition to a site in Phoenix, Ariz. The company has prevented more than 100 tons of air pollution and passed on to its customers more than $1 million in fuel cost savings. EV Rental Cars is affiliated with Fox Rent-A-Car. 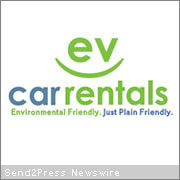 For more information about EV Rental Cars, visit them on the Web at http://www.evrental.com.